For an active Catholic, one of the most important realities of our Faith is the “real presence” of Our Lord in the celebration of the Sacraments, particularly the Holy Eucharist. We are assured by the Church that, no matter how humble the celebration of the Mass or the circumstances in which it takes place might be, Christ is truly present to all those who share in the Eucharistic action. For most of us, the physical form that this presence takes in the transubstantiation of bread and wine into the Body and Blood of Christ himself is, as a practical matter, the primary way that we experience that real presence, especially when received in Holy Communion. Indeed, as used by theologians, preachers, and catechists, the term “real presence” is often a kind of shorthand for that transubstantiation and physical Communion with Our Lord under the appearances of bread and wine. But this does not exhaust the meaning of “real presence” in our sacramental celebrations, especially celebrations of the Eucharist. Christ himself is truly present, but he also makes present to us, through the power of the Holy Spirit, the very events of our salvation—his suffering, death, and resurrection. As a result, when we participate in the Eucharist, we are mystically, sacramentally present at those events no less than the people who physically witnessed them two thousand years ago. In fact, we are more fully present to those events than they were, because we are united by the Holy Spirit with Jesus in his saving work—we experience those events with and in Jesus, and not as mere onlookers. Indeed, our presence and participation in the events of Our Lord’s passion and resurrection is also a “real presence” in our sacramental celebrations: different from, but closely related to the real presence of Our Lord. Thus, when we celebrate the Sacraments, we are not remembering past events from a distance of time and space, as when we remember the Declaration of Independence on the Fourth of July. We are present to and participants in the events of our salvation in a way that transcends the limits of time and space. Contrary to the impression that some have of our Catholic belief, we do not teach that these events are somehow repeated in our own time and space every time we celebrate the Mass. Rather, in each celebration we are mystically joined to those events as they took place once and for all two thousand years ago. of their loving union with Our Lord in the events of his passion, death, and resurrection. For the great majority of us whose journey to these beatific heights is still in progress, however, maintaining even a basic awareness of just what is happening at each celebration presents a formidable challenge. The very frequency of our liturgies can lead us to take this for granted, and the distractions raised by the busyness and the mundane circumstances in the midst of which they usually take place can overwhelm even our best efforts at true devotion. This does not mean that our sacramental celebrations are ineffective in inserting us into the realities of our salvation. Rather, we lack sufficient awareness of all that the Holy Spirit is accomplishing in us, and of our active role in these saving mysteries. In fact, it is often easier for us to maintain an awareness of the real presence of Christ to us in the celebration of the Mass than it is for us to remain aware of our own “real presence” with him in his suffering, death, and resurrection. 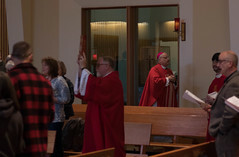 celebrations can be enhanced if we are able, not just to participate in the celebrations themselves, but to interrupt our usual routine of life and work from Holy Thursday through Easter Sunday, intentionally setting aside time and energy for prayer and penance. My own experience of the Triduum over the years has had a tremendous impact on my life and vocation because of the way it has affected my attitudes to and appreciation of what happens at Mass. The cumulative effect of these Triduum celebrations in my earlier years helped me to discover the true value and effect of the Eucharist, drawing me to a desire to offer it to others. The beautiful Triduum liturgies that I experienced in law school at Saint Paul’s Parish in Harvard Square; the inspiring celebrations led by Bishop Kenny here at the Cathedral in Juneau; the experience of community during the Triduum at Holy Trinity Parish in Washington, D.C.; and especially the Holy Week retreat I was able to spend with the Norbertine community of Daylesford Abbey near Philadelphia—all of these were not only inspiring experiences in themselves, but they also enriched my participation in the Mass in more ordinary circumstances. 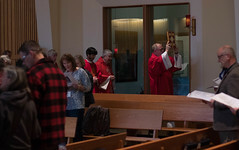 As a priest, I have been able to celebrate the Triduum in widely different circumstances: at Saint Peter’s in Rome with Saint John Paul II; in the humble circumstances of our own communities of Hoonah and Gustavus; at Bagram Airfield in Afghanistan while part of the base was under rocket attack; and at Saint Paul’s in Juneau, Saint Catherine’s in Petersburg, and Holy Name in Ketchikan. Every year, these celebrations offer me new insights into the mystery of the Mass, and the wonder of the real presence of Our Lord to us and of us in the events of his saving work. And every year, as I celebrate the Triduum anew, I pray that the fruit of those earlier celebrations will continue to grow in the lives of us who participated in them, wherever we might be. This Holy Week, please make every effort to take part in the Triduum celebrations being offered at your parish or mission. You might not feel any spiritual effect right away, although I think you probably will. I’m confident, however, that these greatest liturgical celebrations of the year will enhance your experience of the Mass throughout your life. They will, I’m sure, help you, as they have helped me, to grow in awareness of the real presence of our Lord and our real presence in his saving work in every Mass that we celebrate.